Seven full games later, Dunfermline have not managed a single goal since and find themselves adrift from safety by nine points. St. Mirren, thankfully, have not shown themselves to be capable of winning any points in the meantime, and continue a poor run of results which sees them remain as Dunfermline`s one main target. Saturday`s opponents, Dundee United, sit a rather healthier thirteen points ahead of The Pars after a brief spurt of good results after Craig Levein signed up to be Eddie Thompson`s latest managerial recruit in November. Any perceived "honeymoon" period appears to have come to an end however, as United have won one of their last six league games (against Aberdeen) but have suffered heavily against Rangers and Falkirk (once again!) recently. Meanwhile, back at the more important events taking place at East End Park/Pitreavie on a daily basis, Stephen Kenny has had another week to fine tune his squad, complete with the recently added players. Bobby Ryan, Jim O’Brien and now Adam Hammill have all now had at least one full week’s training with the club and will all no doubt be wiser as to how the manager is intending to close that damned gap at the bottom of the table. A millstone around the club’s neck it may be, but with the grand total of THIRTEEN matches to go for The Pars, it needs to be reduced very quickly. St. Mirren have one game in hand, whilst Motherwell have two, with one of them being against the Love St. club in a match Dunfermline must be realistically wanting Well to win. With consecutive away matches in the SPL coming up (a trip to Aberdeen follows in a fortnight) Dunfermline now need to take every half chance as the fixture list begins to draw to a close. Only three of the eight pre split games are at home, and the frankly embarrassing away form needs to be addressed starting on Saturday. Tannadice saw the first away point of the season on the board for Dunfermline back in August, a 0-0 match including a missed penalty from Mark Burchill. Any such award on Saturday will certainly need to be dispatched! Unfortunately, that one point gained in Dundee remains one of only three won on our travels this season. Further draws at Hearts and St. Mirren are the only games that have not resulted in defeats this season, relegation form from a side if there ever was. As if that was not bad enough, Dunfermline have still only scored THREE goals in their twelve away matches this season! If it was any other club producing such figures, they would no doubt be written off as not being remotely at the races. However, it is Dunfermline Athletic we are talking about so all logic must be ignored in the eternal hope that something positive and inspiring occurs, and damn quickly. Along with the new signings, Kenny has been boosted by the return of a remarkably sharp looking Jim McIntyre. Having played for over an hour against the wee team in the Fife Cup, he came off the bench against Rangers last weekend to finally make his first team debut having signed last summer. Along with a keen looking Jim Hamilton, and a once again returning from injury Burchill, Dunfermline scoring options suddenly look a whole lot rosier with experienced goalscorers returning to the ranks. Burchill’s goals were the most obvious reason that Dunfermline finished well ahead of relegated Livingston last season, and it is no coincidence that his injury problems of this season have left the club without a natural goalscorer in the team. Stevie Crawford remains top scorer with 4 goals, which is nowhere near the fine total amassed by Burchill and his penalty box guile last season. Crawford ended up dropping behind McIntyre and Hamilton last weekend, and looking comfortable in a role that many supporters have envisaged him playing in both during his current, and previous, spells at the club. Perhaps this could kill two proverbial birds with one stone, and Crawford could be the answer to the poor service received by the frontmen so far this season? 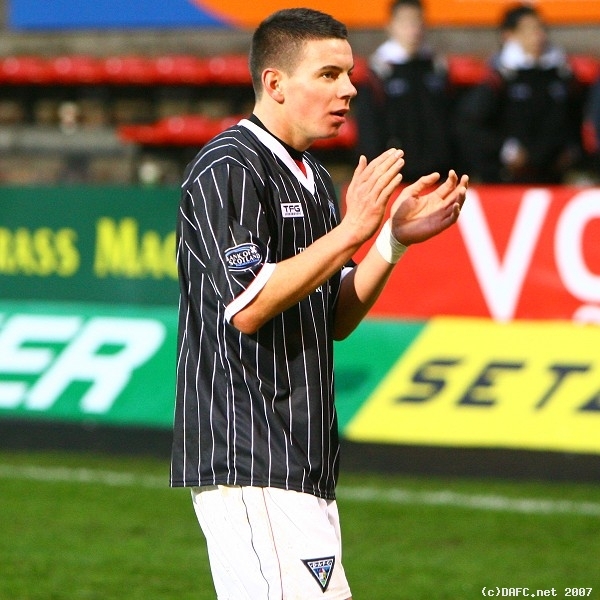 His craft, workrate and skill levels could well put chances the way of the two Jims and a returning Burchill…..
With options returning to the squad, Dunfermline appear to be at full strength at long last. Scott Thomson is the sole long term injury victim, with his return date unknown in the media at least. The press have reported this week that both Andy Tod and Aaron Labonte (at least on loan) can find alternative clubs, with the manager confident that the team is well covered in the defensive department. The transfer window remains open for another few days (closing at midnight on the 31st January) and there could yet be additions to the Dunfermline ranks before it closes. In the meantime, the existing team must go to Tannadice and achieve a result to match THAT game in 1996 or THAT game in 2005 and kickstart the great escape, 2006/07 style.